Dr. Colander is a Southside native from Queen of Martyrs Parish and a graduate of Brother Rice High School. He obtained his Bachelors of Science degree from Loyola University Chicago. After earning his degree form Illinois College of Optometry, Dr. Colander completed an ocular disease residency providing care to veterans at the Huntington VA Medical Center in Huntington. Dr. Colander not only provides routine eye exams, but treats a wide variety of eye conditions including but not limited to, macular degeneration, glaucoma, and cataracts. When not at work, Dr. Colander enjoys running and spending time with his wife Maribeth. Our mission at Colander-Nolan Eye Clinic is to provide our patients with great eye care through personal attention and advanced technologies. Our eye doctors will provide you with the best care to keep your eyes at their highest potential. 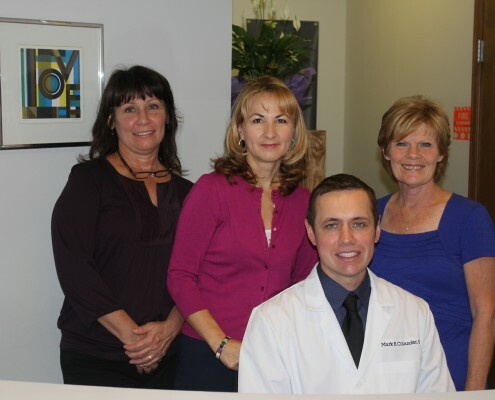 Our office strives to provide you and your family excellent care in a happy, healthy and comfortable environment.